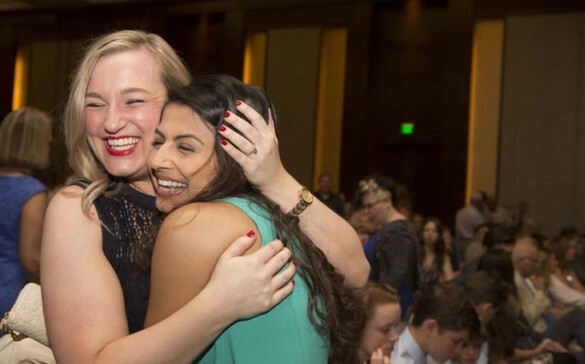 Nearly 300 Vanderbilt University School of Nursing (VUSN) students were recognized for completing their programs of study during a pinning ceremony held Sunday at the Omni Hotel in downtown Nashville. Professional pins of Nursing were awarded to 267 students who completed their Master of Science in Nursing, pin guards were presented to eight students who finished their Doctor of Nursing Practice courses and certificates of completion were given to 15 post-master’s students. More than 2,000 friends and family members filled the Omni’s Broadway Ballroom. Vanderbilt’s Master’s nursing program begins and ends in August. The pinning ceremony formally recognizes those who earn a Master of the Science of Nursing, as entry into advanced practice nursing; a post-master’s certificate, recognizing a specialty in addition to having already earned an MSN; and a DNP, as the terminal practice degree in the profession of nursing. 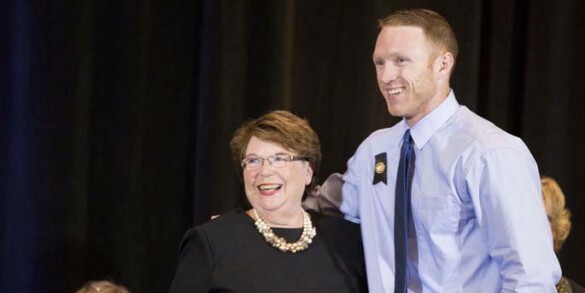 Those who participated in the pinning ceremony were also encouraged to return to campus for Vanderbilt’s official commencement in spring 2016.
he professional pin harkens back to legendary nurse Florence Nightingale and her work in the Crimean War, and is a symbol of completion of a nursing program of study. In 1916, the nursing pin became a standard way of recognizing excellence in nursing. Each nursing school around the world awards its own specially designed pin to recognize achievements in nursing education. VUSN’s pin features Cornelius Vanderbilt, the founder of the University. Other awards included the Amy Frances Brown prize for excellence in writing, given to Kelly DeWyer, and the VUSN alumni award, given to Lisa Baldwin. Several faculty members were also honored for outstanding contributions to teaching and scholarliness as determined by students: Susie Adams, Ph.D., R.N. ; Angel Anthamatten, DNP; Kristen Barry, MSN; Susan Beaird, DNP, MSN; Amy Hull, MSN; Cathy Ivory, Ph.D., R.N. ; Jennifer Kim, DNP; Patti Scott, DNP, APN; and Megan Shifrin, MSN, R.N.